Laelaps was a female Greek mythological dog who never failed to catch what she was hunting. … Cephalus, decided to lend the hound to hunt the Teumessian fox, who could never be caught. The inextricable chase went on until Zeus, perplexed by their contradictory fates, turned both to stone and cast them into the stars as the constellations Canis Major (Laelaps) and Canis Minor (the Teumessian fox). (See: Apollodorus, "Bibliotheca" 3,192. and; "Nature Guide Stars and Planets." p. 275. DK Publishing 2012. Penguin. ISBN 978-1-4654-0353-7). In Samson's story, the paired canines were foxes, connected at their tails, a blazing fire between them. They were presumably running back and forth to escape the flame, (following, but not really chasing, each other.). It's perhaps understandable that the Greeks could've corrupted the story of Samson's paired foxes, into their unresolved chase myth. The dog stars are portrayed as a pair (During the wildfire season, the blazing sun appears between them.) as well. Next we need to show an association, of the "Teumessian fox," with crop burning wildfires. For this we consult the myth of "Aristaeus." Hyginus reports; "Canicula. It is called Procyon by the Greeks, because it rises before the greater Dog. ... Canicula rising with its heat, scorched the land of the Ceans, and robbed their fields of produce ... Their king, Aristaeus, son of Apollo and Cyrene, and father of Actaeon, asked his father by what means he could free the state from affliction. The god bade them expiate the death of Icarus with many victims, and asked from Jove that when Canicula rises he should send wind for forty days to temper the heat of Canicula." (Hyginus, “Astronomica,” 2. 4). See how Hyginus, although using the Latin "Canicula" ("small dog"), says "It is called Procyon by the Greeks, because it rises before the greater Dog" ("Procyon" meaning "ahead of the dog.") The Greeks envisioned the "Teumessian Fox" not a dog). We nowadays call it Canis Minor. The fox was subsequently confused with the dog (which was introduced later as a futile remedy to the ravaging effects of the original fox). Tracking the “Dog Days” tradition to Samson's foxes, has wider anthropological significance, for the identification of the “Pelasgians,” who must've been the Scriptural “Philistines”. This won't surprise those who identify “Danaans” with “Danites.” According to Strabo, “Geography” 5.2.4, Euripides says that Danaus, after settling in Greece, decreed; that all “Pelasgians” should henceforth be called “Danaans.”. (Please see my article “Aristaeus the Pelasgian/Philistine Samson” referenced at the end of this piece). The Pelasgians of the “Minoan Island” Ceos, had their own recollection of the story. As Apollonius (3rd century BC) relates; "Sirius was scorching the Minoan Islands from the sky, and the people could find no permanent cure for the trouble till Hekatos (Apollo) put it in their heads to send for Aristaeus. So, at his father's command, Aristaeus ... made ritual offerings in the hills to the Dog-star and to Zeus Kronides himself. In response, Zeus gave his orders, ... and the Etesiai refresh the earth for forty days." (Apollonius Rhodius, "Argonautica" 2. 518 ff.). The number "40," used as a time period, is widely attested to Hebrew convention. “Aristaeus, an ancient divinity worshiped in ... Ceos, ... which had once been inhabited by Pelasgians." (Dictionary of Greek and Roman Antiquities, under "ARISTAEUS," -1870). The Pelasgian version of Aristaeus seems to be the inverse story of the Danite Samson, Aristaeus alleviated the scorching (caused however, by his Father the sun god with the pair of "dog" stars), while Samson was said to have caused it. However in the Hebrew story, the Philistines seem to be attempting to assuage Samson with the death of the girl and her father (Judges 15:6). Just as in the Greek version, Samson's fox burning plague had to be appeased with “victims” (This is the term used by Hyginus, Apollonius Rhodius uses the phrase “ritual offerings.”). The doomed father and daughter are left unnamed in the Scriptures, while the Greeks have “Icarus” (Bootes) and “Erigone” (Virgo) respectively. Despite some few differences, similarities between Samson's story and the Aristaeus myth, include; Samson's "vineyards of Timnath," paralleled as Icarus' vineyard. The maiden's father hosts a drinking bout (the word usually translated as "banquet" or "feast" at Judges 14:10, was the Hebrew "Mishteh" in reality means "drink" or "drinking.") in both cases. The shepherds of the Greek myth serve as the Scriptural companions (Judges 14:11). The kid as the goat “Samson visited his wife with a kid” (Judges 15:1), “a goat is said to have broken into the vineyard, and nibbled the tenderest leaves he saw there. Icarus, angered by this, took him and killed him” (Hyginus, “Astronomica” 2.2). And, Samson's foxes joined with the firebrand (Judges 15:4) are the scorching stars of the Greek fox and dog joined by the Sun; "Sirius the Dog-star smitten by Hyperion's full might pitilessly burns the panting fields." (Statius, "Silvae" 3.1.5). Aratus says; "A star that keenest of all blazes with a searing flame and him men call Sirius. When he rises with Helios, no longer do the trees deceive him by the feeble freshness of their leaves." (Aratus, "Phaenomena" 328 ff.). And here from Quintus Smyrnaeus; "up springs Helios in glory, flashing fire far over earth-fire, when beside his radiant chariot-team races the red star Sirius" (Quintus Smyrnaeus, "Fall of Troy" 8. 30 ff.). Samson must have had a great following among Sun worshipers, his very name derives from the name of the Sun god "Shemesh." Thus the blazing fire between Samson's foxes became analogous to the Sun rising between the "dog" stars during the height of the wildfire season. He was also a major Messianic figure, promoted far and wide as the much anticipated hero. It wasn't only the Pelasgians who knew the story of Samson but other groups of Greek immigrants were familiar with his story as well, for besides Aristaeus, the son of the Sun god Apollo, there is reason to believe that Samson also served as the archetype to several, even more well known, solar heroes. The same "Teumessian fox" or "Cadmean vixen" is associated with both Oedipus, and Herakles. Now, Herakles is an obvious derivative from Samson. Amphitryon, the Father of Herakles, moved his family to Thebes (where Heracles would kill his first lion, and his first wife,) because he was commissioned to slay the Teumessian fox; 'Amphitryon would free the Cadmean Land of its Fox. For a wild Fox was creating havoc in the land." (Apollodorus, Bibliotheca 2. 57). Herakles was to free the Thebans from the Minyans (a Pelasgian tribe) just as Samson did the Judeans from the Philistines; "he both burned the palace of the Minyans and razed the city to the ground." (Diodorus Siculus, “Library of History” Book 4, Chap. 10, 5). And although Herakles, like Samson, was associated with his "pillars" he wasn't blinded, however Oedipus was. Seneca told the story of Oedipus wherein Thebes was plagued by a drought; "Titan (the sun) augments the scorching dog-stars' fires" (Seneca, Oedipus 37 ff.). Corinna also ties Oedipus to the crop burning fox; "Oedipus killed not only the Sphinx but also the Teumessian fox." (Corinna, Fragment 672. Greek Lyric IV). Thus the fox is linked to the death of the maiden/lion Sphinx of Oedipus. Not only the Greeks but the Romans also, associated foxes with crop burning wildfires, as is evidenced by one of Ovid's accounts ("Fasti" Book 4), who wrote, in explaining the origins of a Roman festival called the Robigalia, that It was an annual custom in Rome, to release foxes in the circus, with lighted firebrands on their backs to watch them burn up. Ovid inquired into the custom's origin and found that the Romans were commemorating an ancient incident where a young man had captured a pesky fox, tied straw to it and, set it on fire. The frantic animal rushed into the standing corn which was summarily consumed. The Roman tradition sought to retaliate in kind, against all foxes for the loss of the crop. Petrus Serrarius (a Dutch millenarian theologian, 1600–1669) and Samuel Bochart (a French Protestant biblical scholar, 1599 –1667) finding the explanation about the young man and the pesky fox to be an unsatisfactory cause for such a well-established institution, concluded that the Romans likely derived the practice from Judea, as an to allusion to Samson and his foxes where, probably the burning of the Philistines' corn might, for some time, have been annually commemorated. (See Adam Clarke's Commentary on the OT, Volume 2. "The Book of Judges" Notes on Chap. XV, Verse 20). In light of the foregoing, an hypothesis may be surmised as follows; The Egyptians associated the Sun and Sirius rising together with the flooding of the Nile. However the Hebrews, Greeks and, Romans linked it to the wildfire season, as per the Samson story. The Danite champion was evidently taken as the messiah of a widespread solar cult and, along with his canine accomplices, gained heavenly status. As such, the story made its way to Greece, where the Pelasgians apparently knew him as Aristaeus. Thus the season, previously established by the Egyptians with flooding, took on a new connection with crop burning wildfires. Thus explaining why certain stars were “dogs” and, how the Sun, in conjunction with the “dog stars” was responsible for burning fields. So, certainly the Greeks and the Romans have their roles to play in the continuum but in my view, we are remiss in overlooking the influence of the Hebrews when considering the origin of the modern idiom of the "dog days," particularly as it has to do with the account of Samson and his field blazing foxes. 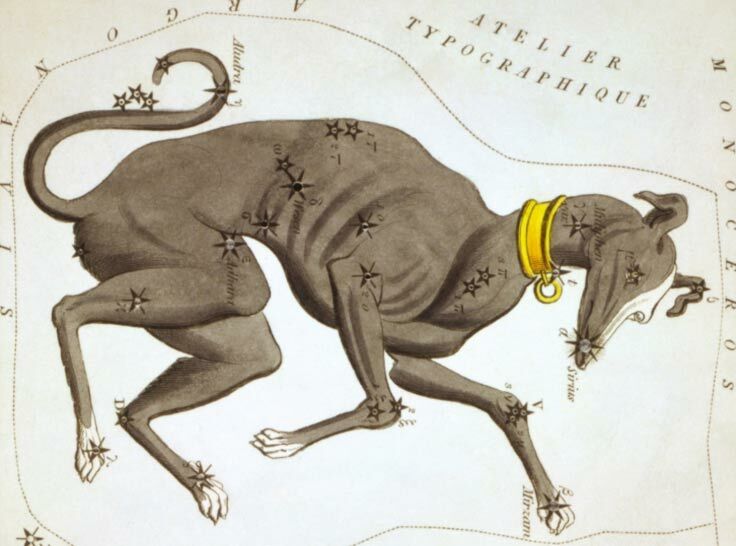 Featured image: Crop of " Canis Major , Lepus, Columba Noachi & Cela Sculptoris ", plate 30 in Urania's Mirror . ( Wikimedia Commons ). Jan C. Zadoks – On the Political Economy of Plant Disease Epidemics .